Well those lovely dumbies are back again in another adventure where you have to make sure you save as many Lemmings as possible from some dreadful death. Haven’t heard of the Lemmings? Well the idea is that a whole group of the little guys march directly to their death and its up to you to save them. 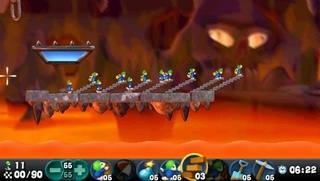 I’ve played Lemmings since it’s inception on, I think it was the Amiga back in the day. It actually hasn’t changed that much but I was curious to see how easy it would be to control the little guys with a console. 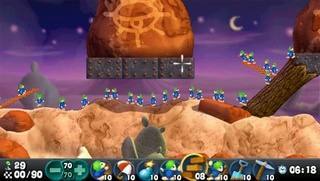 The aim of Lemmings is to help them. So you select the tools that they need, select the Lemming that needs to do the job and away you go. Having been used to using a mouse to get the job done and selecting my Lemmings, I was curious to see how it would go, but I am pleased to say that the PSP is more than up to the task. Graphically the title is a treat to the eyes and really suits the characters and their little suits and hair. The environments certainly look sinister and are just as fun as I remember them being way back when. There are also a ton of new maps for you to make your way through and a level editor to devise new torments for your little buddies. Racing against the clock to get all the Lemmings safely home at first seems like a bit of an easy task but once you get the difficulty rating up in the game you will actually curse the clock for much of the game, certainly as the pace heats up and the timing runs down! Despite the fact that you are playing on a small screen, this has been compensated for by the ability to zoom in on the action and have a bit of a closer look around. The whole experience is a lot of fun and I think that people who give this title a shot are going to be really glad that they bought it. Old school gamers might want to think about the title for the mere fact that you will feel like you are playing a port of the title, the levels are the same and the look of the game whilst improved, doesn’t differ too much from the original. Having said that, I recommend this game. You will be playing it for ages and it’s simply a joy to play, not to mention a real challenge in the later stages. The learning curve is nicely taken care of at the beginning to make sure you are ready for what is dished up to you at a later stage.